1253 Camellia Cir, Weston, FL.| MLS# A10599635 | Susan J Penn l Best Agent l Buy & Sell South Florida Homes! PRICED TO SELL NOW! 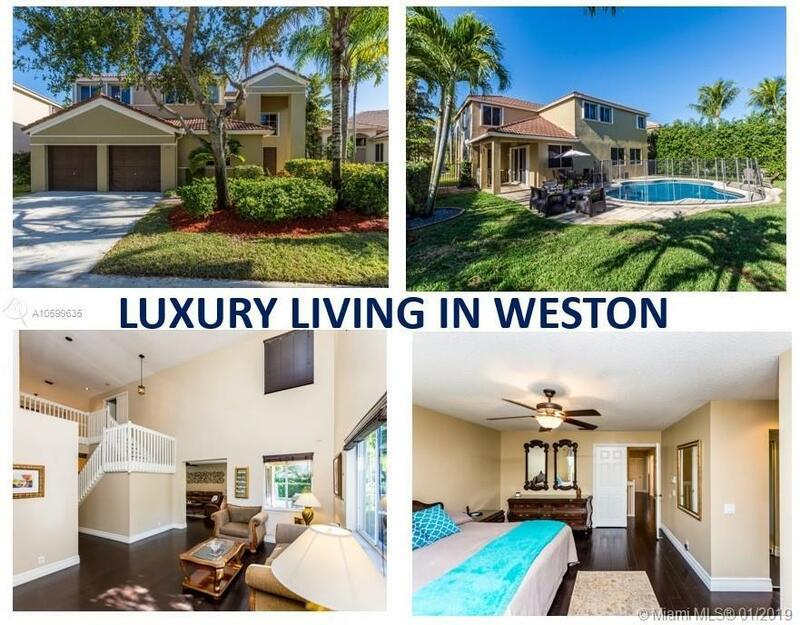 MUST SEE 2-STORY, CUSTOM POOL HOME IN THE HEART OF WESTON - CAMELLIA ISLAND. DOUBLE-DOOR ENTRY W/NEW HARDWOOD FLOORS THRUOUT MAIN AREA. 2924SF, 4BR/3BA, 2-ZONE AC & 19' CEILINGS IN LIVING ROOM. INSIDE & OUT PAINTED IN 2017/18. LARGE MASTER SUITE UPSTAIRS W/2 WALK-IN CLOSETS & NEW FRAMELESS SHOWER, ROMAN TUB & SEPARATE TOILET ROOM. 1 BR GROUND FLOOR CURRENTLY USED AS OFFICE, W/ENSUITE FULL BR W/NEW TUB/SHOWER. LARGE LOT IDEAL FOR ENTERTAINING. FREEFORM POOL W/CHILD/DOG FENCE, COVERED PATIO AREA FOR GRILLING & LOTS OF SPACE FOR KIDS & PETS TO PLAY. BONUS UNDER-STAIR STORAGE, SEPARATE LAUNDRY ROOM W/NEW WASHER/DRYER, ACCORDION SHUTTERS ON 2ND FL & PANELS ON GROUND FL. COMMUNITY HAS PARK & BBALL CTS. WALK TO SCHOOLS, SHOPS, FOOD & WORSHIP. 24-HOUR MANNED GATE & SECURITY. Directions: Royal Palm To Island Way, Follow To Guard Gate. Past Stop Sign And Left Into Camillia Island. Turn Left Onto Camellia Circle And Follow Around To 1253. Home Will Be On The Left Side.